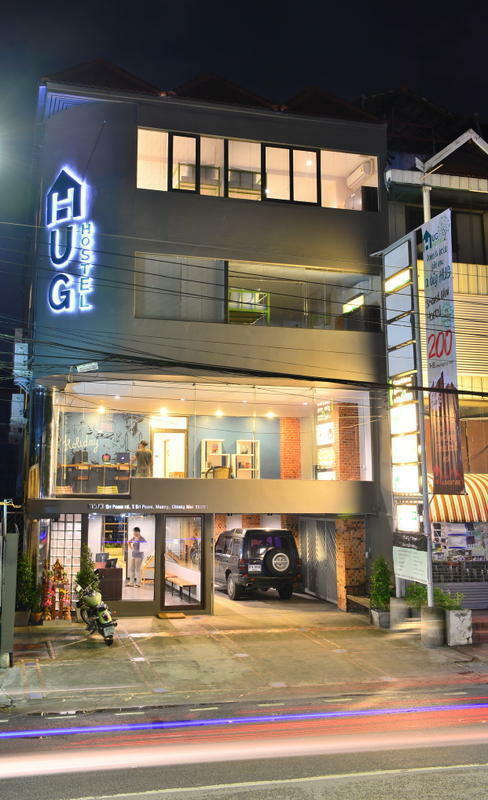 Situated within the walls of the old city at Chang Puak gate (north gate), Hug Hostel is perfectly placed. Walk or cycle to all the major attractions. Or catch a â€œSong Taewâ€ (red truck) or â€œTuk Tukâ€ from the hostel doorstep. Hungry? Enjoy authentic Thai and international food at Hug CafÃ©, or eat at the local markets, stalls and restaurants nearby. There are 24-hour convenient stores just across the road also. The famous Sunday market and the city's bars and clubs are in walking distance. Our hostel is four-story building with 12 rooms including two 12-bed mixed dorm rooms, a 10-bed mixed dorm room, two 8-bed mixed dorm rooms, a 6-bed female dorm room, a 6-bed mixed dorm room, a 4-bed female dorm room, two 4-bed mixed dorm rooms and two double bed rooms (private room). Our dorm rooms are furnished with bunk beds and comfy mattresses with linens. Each bed comes with a private reading light, power socket and huge locker. Our share bathrooms are also equipped with hot shower and we have a nice towel for rent. Free Wi-Fi and smile are served for the entire building. Start the day with a delicious breakfast in Hug cafÃ©, let our friendly staff organize a tour and meet new friends in our cool common areas. There is only 4.5 km (a 10-minute drive) from Chiang Mai international airport, and only 15-20 minutes driving from train and bus station. By car and walking, from Tha Phae gate (east gate) of the old city, take a road along the moat inside the old city called â€œMun Muangâ€ which is facing to the north. Go along the road and make a left at the northeast corner, then you will be on Sri Poom road (facing to the west). Go along the road until you see the north gate of the old city named â€œChang Puakâ€ gate on your right. Go straight on for only about 30 meters away from the gate, our hostel building will be on your left in grey color. There are also a big sign of our hostel placed on the building itself and another one in front of the hostel, so you will not miss us.